Carnac the Magnificent: "Game thread procedure." Ed McMahon: Game thread procedure. Ah, very timely. Ed: Your wisdom is uncanny, and beyond the ken of mortals. I stand corrected. Or, not. Still, the games are almost upon us. So, too, will be the game threads. Carnac: So, too, will be the Padres 10-game losing streak. Ed: To begin the season? I need to go visit my favorite bookie. Carnac: Do not misuse the gift of mystic knowledge. Ed: I won't misuse it. I'll just make some money. Carnac: Just ask American Family Publishers for another advance. Ed: My sponsor thanks you for the plug. Carnac: We're getting off the subject here. Wouldn't you like me to open the envelope, which until now has been hermetically sealed in a mayonnaise jar? Ed: If you would be so kind. Please reveal the question which "Game thread procedure" answers. Carnac: (opens envelope) "What does your surgeon recommend when you rupture your game thread?" Edited by Hosken Bombo Disco, 25 March 2019 - 05:30 PM. That is, technically speaking, a very well-written and thought out joke. Thank you. And a tip o' the turban to you in return. May the fleas of a thousand camels infest someone other than you. "Human sacrifice, dogs and cats living together, mass hysteria!" Maybe someone can give the procedures for starting a game thread. ...you might even get a classic Chief joke or three. I would have thought the idea would be to encourage people to start game threads, not discourage us. Well, you do need to abide by the usual rules here. So it's more like most holds ... not barred? I dunno, basically there is no procedures. If you come here looking for the game thread and see one hasn't been posted yet, feel free to fire one up. The simple answer is frequently not acceptable to the masses. I have some sad news to share...my good buddy passed away last week. At the funeral, Mrs Chief and I sat in the front row, alongside my friend's grief stricken widow. At some point during the ceremony, she looked at me and asked me "you two were so close, could you say a word?" Well, how could I refuse? I made my way to the pulpit, faced the crowd, and said ... "plethora." As I sat back down, the widow looked at me, tears streaming, and said, "thank you. That means a lot." Maybe you can explain how to start a new thread. Start at the beginning. Edited by Winston Smith, 25 March 2019 - 10:29 PM. These yokels are so helpful, aren't they? 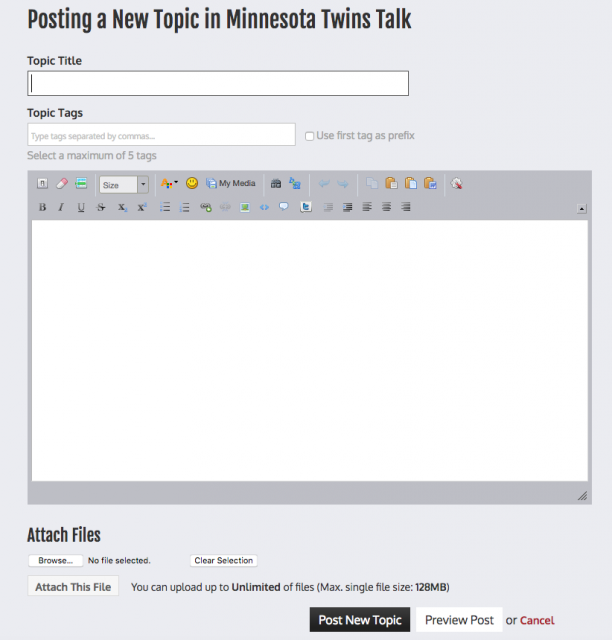 Go to the Twins Talk forum. See that black rectangle in the upper right of the forum? (see photo below) It says 'Start New Topic'. Click on that. Fill it out. In the 'Topic Title' space, that's where you put "Game Thread: Twins v whomever, the date and time" ... or something like that so that people know ... this is that day's game thread. Then fill out the body of your topic. It can include anything to get the game going ... lineups, pitchers, weather ... whatever you think is necessary to get the game thread going. When you are finished, click on the box that says 'Post New Topic' and voila! You've posted a game thread. As I sat back down, the widow looked at my, tears streaming, and said, "thank you. That means a lot." It may still be spring training, but Chief is in mid-season form already. I'm sure he cherishes your remark plethora. Thank you for all the dummies out there. Possibly my favorite Bloom County installment ever.